There Goes Our Neighbourhood, which documents responses to the redevelopment of the Waterloo estate and the creation of a community light sculpture in two of the high-rises, premiered November 20 on the ABC. Andrew Collis met with director Clare Lewis to discuss the making of the documentary, social change, protest and community spirit. You began working on the documentary in 2016? Yes, in early 2016, not long after the redevelopment announcement made by the state government in December 2015. As soon as that happened I started asking questions and talking to Carolina Sorensen [film producer], and meeting with some of the community groups in the area. Some of the neighbours began the discussion about this light project idea [#WeLiveHere2017]. It was a very unformed idea at the start, and we knew that for the project to work it had to be collaborative, it had to be owned by and created with the public housing residents who would be most affected by the redevelopment. We finished the film in March 2018 – so it took two years all up, and that includes the mechanics of creating the community light sculpture, developing the film and securing finance for both. The ABC licensed the film and we’re delighted it has been released at a moment when the film can have some kind of real effect on perceptions of Waterloo and the planning processes for Waterloo’s future, also before the March state election. One of the key aims of the film was to get public housing into the general discourse – to humanise the face of public housing, to celebrate what is a very established and well-loved community. I feel like that’s happening through the art project, the documentary and our social media presence. I’m particularly proud of our Instagram portrait and story series @WeLiveHere2017 (inspired by the photo essay feed #HumansofNewYork) that we’ve been running since 2016 with various guest photographers, which gives yet another platform to the people of Waterloo. Having the documentary air before the release of the masterplan is helpful. Yes. One of the most contentious parts of the plan is the proposed density levels, which in Waterloo seem fairly extreme. And also, in the context of a public housing waiting list that is so long – nationally, there are almost 200,000 people on the list, with a waiting time of up to 10 years – it seems slightly crazy that there are no plans to increase the public housing and affordable housing quota in the redevelopment, on what is currently public land. I think having a precinct that is majority private developments will change the entire dynamic of Waterloo, and I think that’s what the government is hoping. It’s hard not to see it as state-endorsed gentrification. Which is what both Richard [Weeks] and Aunty Jenny [Munro] say in the film. There seems to be a real move away from governments seeing themselves as responsible for people in need, a move away from the egalitarian idea on which public housing was first built, and making housing available to all. They are systematically washing their hands of that responsibility, and housing estates across the world are under fire. Even the process of moving housing across from government-owned and managed to community housing providers shifts the nature of social housing and has its own problems and complexities. It shifts the nature of that service provision. It means there is legislation that protects the community housing providers and doesn’t necessarily protect the tenants, for instance. There are different caps they can set in terms of what people earn in order to be eligible, or what proportion of their pension needs to be spent on rent. Anxiety levels and stress levels have been higher since the announcement was made. It certainly feels like the length of time it’s taken since the announcement has naturally had a very destabilising effect, and the removal of key community workers, such as Counterpoint Community Services’ Laura Kelly, only serves to compound the feelings of disempowerment, of uncertainty. So people who were perhaps made to feel very anxious have opted to transfer. And the government will use that, saying: “Oh, there’s a high level of discontent and transience, everyone wants to leave anyway.” It’s hard to see how they can avoid using that in their favour by implying it’s not a desirable place, that it needs to change, it needs to be cleaned up. I would argue that if a government announces a massive redevelopment, doesn’t invest in local services, fails to maintain housing stock and leaves people in limbo for so long, it has a massively destabilising effect on the community. It’s hard not to assume that the government’s decisions have been deliberate. I certainly do not have the answers, but my understanding is that public housing stock has been severely underinvested in since the 1990s. At one stage an average of 2.5 homes were being sold off every day from government housing stock. There is a huge hole where the government’s housing policy should be, and a recent report stated they should be building 3,000 homes per year for the next 20 years to keep up with demand. Everyone has a right to a home, it’s the most fundamental human need, and it’s not currently being met. There’s also a growing need for far more active and engaged community service programs that help people with mental health issues, addiction, isolation; chronic employment issues, disabilities, aged care. There are so many ways the government could be working more actively and creatively toward solutions to some of the problems that exist in vulnerable communities. But when you don’t invest enough in people and education, then by default you exacerbate those problems. One of the aims of the film was to get public housing into the discussion and a more educated response to the imminent masterplan. I personally don’t see divisions. I see a diverse, thriving community of people no different from anyone else, who deserve to have a home in the inner city and to be looked after if they need it. And I would say that, yes, the film’s about celebrating the people and stories that make up the towers and the Waterloo estate. Also, I think getting people to understand that there are major decisions being made about the way our city is being developed – it’s important to engage with how that’s happening, to have an opinion, to fight for the kind of community you want. And the homogeneity of a hipster-restaurant neighbourhood doesn’t make for as interesting a place. It doesn’t make for a cohesive community necessarily. Gentrification is pushing out the very things that make this suburb unique and desirable. The new homes for public housing tenants will arrive, but at what cost? What will it feel like? Already rents are pricing small businesses out, artist studios are being bulldozed for the Metro, green spaces will become private courtyards and public housing may be concentrated around the fumes of Westconnex! It’s not looking pretty from where I’m standing. I just hope that the twin towers – these beacons to the community, this towering majestic brutalist architecture – remain in the hands of the public and aren’t just sold off and valued for their social welfare past. There are some lovely images of the towers in the film. Yes, Matt Chang at Rotorworks did those on Waterloo Green quite a long time before the light project, for our trailer. It was like the buildings were always meant to be seen from the air – they just really sang in that light. They shift beautifully with the weather. I know Matavai and Turanga residents have been told there won’t be anything happening there for 10 years. But there’s a far bigger question about the future of public housing on that site and who gets to be in those buildings and who gets to live on this public land in the longer term. There are a lot of people who are very attached to the architecture and the form of those buildings, along with the community. It should also be noted, though, that some people are pleased the redevelopment is taking place, the towers are not popular with everyone. There were some negative reactions to the film? 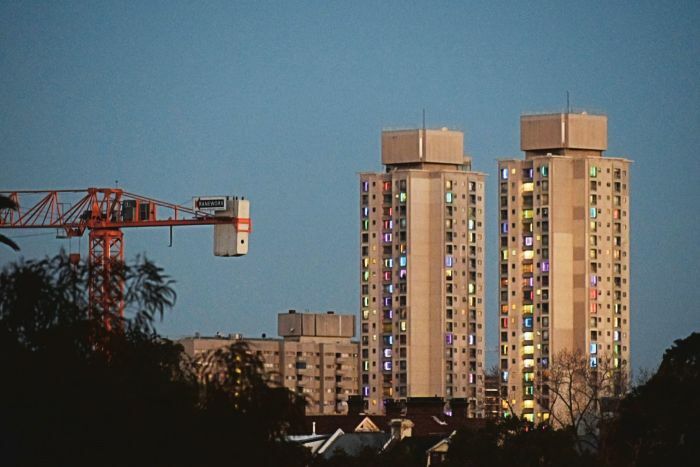 There were certainly some comments like: “You’re painting this suburb in too positive a light. I grew up in those towers and I can’t wait for them to come down.” It’s never a unified front. Of course, as with all documentary narratives, it’s subjective. We could have cut the film in many different ways. But we feel our experience is pretty accurately captured in the way we’ve edited it. And we would love to have included many more of our encounters, but we were definitely under pressure to represent views from outside the estate, to represent the developer’s outlook, the local entrepreneur’s outlook. I spoke with a local business owner, and when I heard his point of view I explained that we wanted to represent all views in the area. It’s hard to find people willing to say what they think about the public housing tenancies in the Waterloo area. Much as I don’t agree with his view, I respect him for articulating his position. He comes from a migrant family who worked very hard all their lives. They came from Hungary with nothing, and so his views are informed by his parents and his upbringing. But perhaps his perspective would shift had he helped us install the lights and got to meet the people there. They are not bludgers, many are simply retired, or on low incomes … without enough super to afford a luxurious nursing home. There are all sorts of circumstances. Exactly. There but for the grace of God go we. A messy divorce, a broken hip, a failed business, a history of abuse. Unfortunately, many people have a one-dimensional view of what public housing is. It’s really only when you go to somebody else’s home, into somebody’s personal space, that you realise the kinds of lives people are leading. We’re just very lucky to have encountered so many inspiring people in the process. So many cups of tea, and great stories. There was real warmth in a lot of our encounters and there was often gratitude for the human contact. We did feel in a way like social workers doing quick house calls and checking in on people. It was a very intensive time for us physically and emotionally, on lots of different levels. But whenever I go back there, there’s always loads of nice chats and hellos … relationships continue long after the light project and the film.